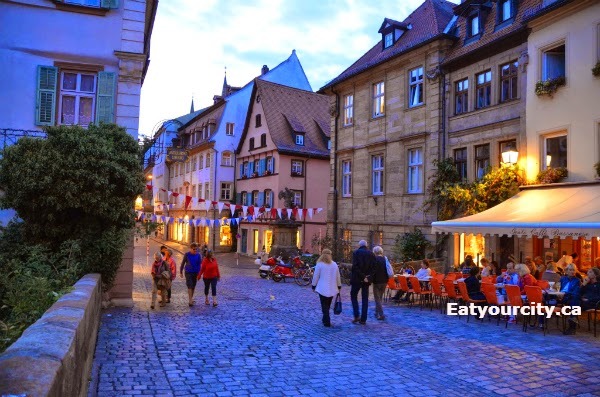 With all the streets being cobblestone, multitude of one-ways, crazy hills and more interesting fun things that make driving in Bamberg a mind boggling adventure, we were more than happy to ditch the car and explore Bamberg by foot after dinner. Luckily, the restaurant was super close to the hotel, so we joined plenty of folks heading out for a drink and dinner. There were lots of people getting off from work and stopping inside to pick up a beer, then head out for a chat and sip with other like minded Germans just outside the picturesque two story brewery and restaurant. 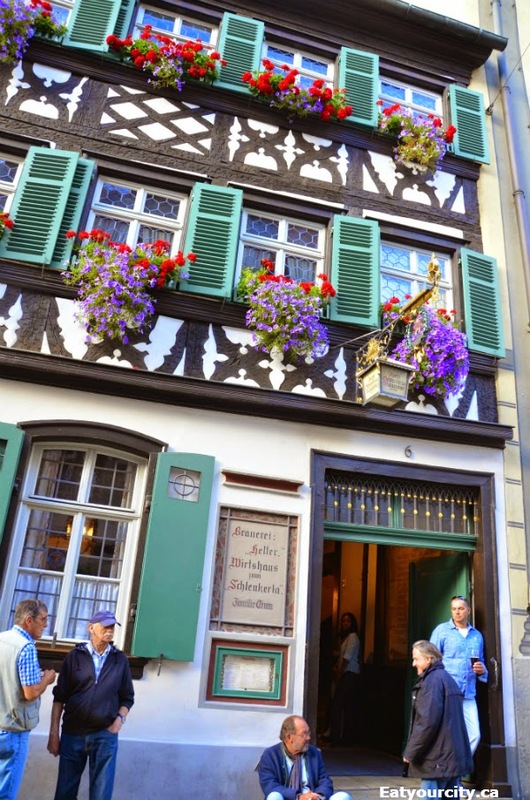 It still boasts the original Der Ausleger am Schlenkerla or Schlenkerla sign - There's a blue lion symbolising the old house-name, first documented in 1405. 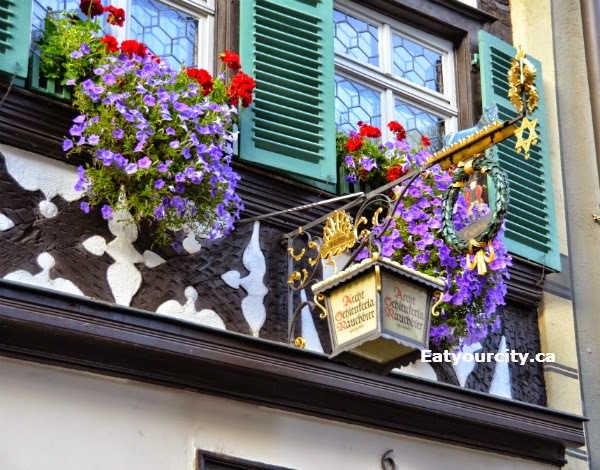 There's also a six pointed star, the traditional guild-sign of the franconian brewers, also known as the brewer's star. Inside, you could either self seat yourself in the Dominikanerklause which used to be a Dominican house chapel in 1310, in the inner court next to a 500-liter wooden-keg, or in the Das "Alte Lokal" or "Old Inn" where the old ceiling wooden beams of the low ceiling used to be painted with ox-blood for protection and darkened over the centuries. 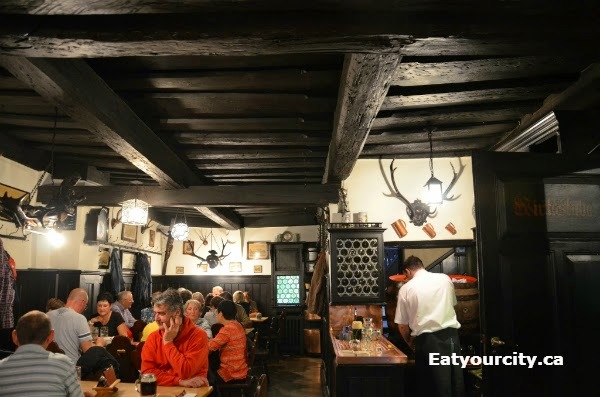 The walls are adorned with several historic engravings of Bamberg, like the 1493 "World Chronicle of Schedel" and even a family tree of the ancestors of the Trum/Graser families that have owned this brewery and restaurant for centuries. We joined a friendly table of a few businessmen, a German couple travelling around Germany, and an American couple who were planning to bike parts of Germany with their cycling club. The waitress is super efficient, managing all the multitude of shared tables in the room and gives us a quick run down of their famous smoke beers after she gets us the English translated menu. We didn't have to wait long after we self-seated before she got us menus and beers! And do they ever go through a lot of their smoke beer - they had to change out one gravity-fed oakwood cask a few minutes after we sat down! 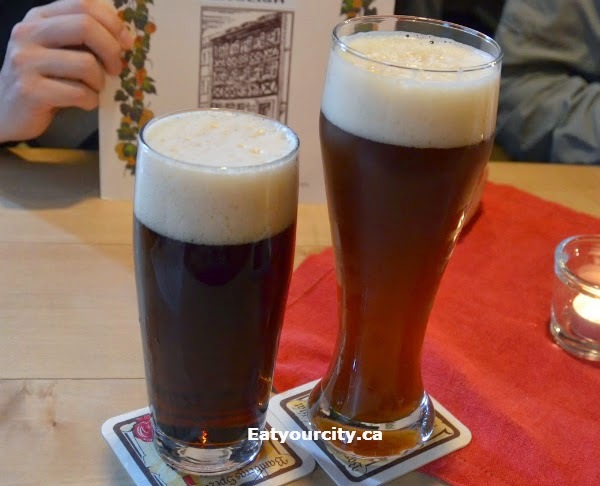 We tried both the Original Schlenkerla Smokebeer Märzen - Maerzen / Aecht Schlenkerla Rauchbier - and Original smoked wheat beer / Schlenkerla Rauchweizen as you can't claim you've been to Bamberg until you've sipped on their Schlenklerla. Its name is derived from "Schlenkern" -an expression for walking not straight. 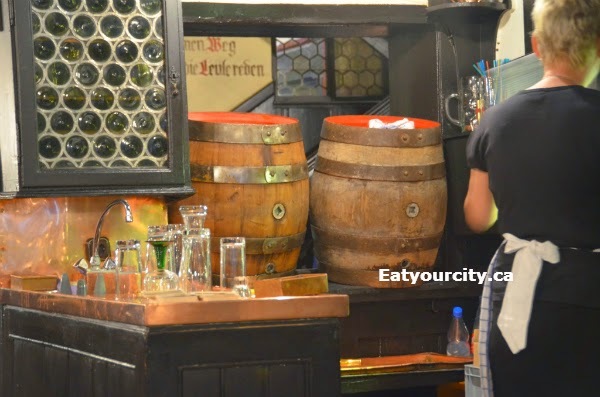 Schlenkerla is a dark, aromatic, bottom fermented beer with 13.5 percent alcoholic content and its smokiness comes from smoking the grains later used to make the malt over breech wood fires. 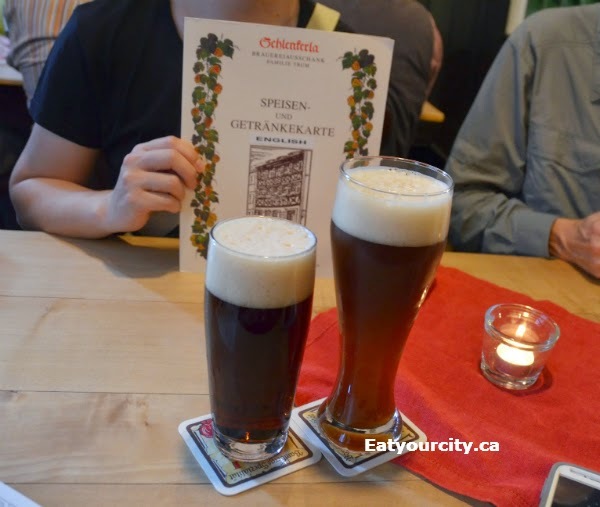 The original Schlenkerla is a bottom fermented beer that is rich, sweet and malty with a fairly strong smokey flavor. We had worked up an appetite lugging luggage back to the hotel and strolling around town, so we did the menu justice and... ordered a ridiculous amount of food! 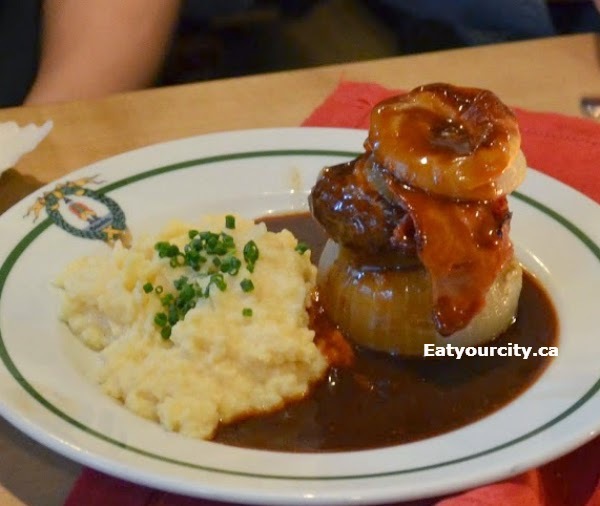 :D First out was the Bamberger Zwiebel in Rauchbiersoße mit Kartoffelbrei or Bamberg-style onion with Smokebeer sauce and mushed potatoes. 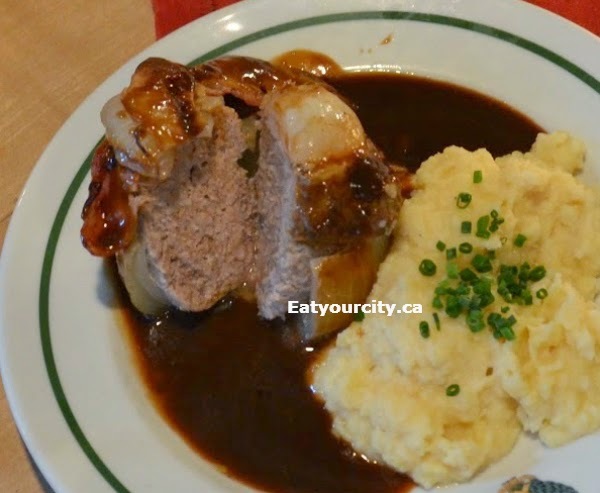 This is a traditional dish where a super sweet onion is hollowed out, stuffed with a seasoned ground meat mixture and slow roasted to perfection. And yes, there's also bacon in there.. woo! 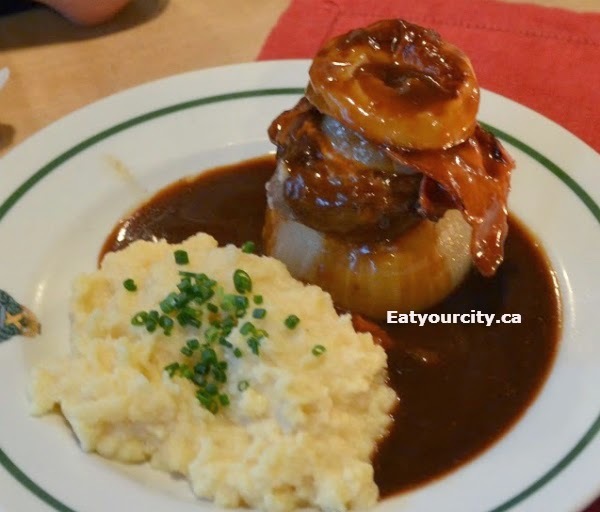 The onion was super caramelized sweet and tender, which worked really well with the savoriness of the well seasoned meatball within and all swimming in plenty of savory beef gravy and aside of super fluffy buttery mashed potatoes.. Nom! 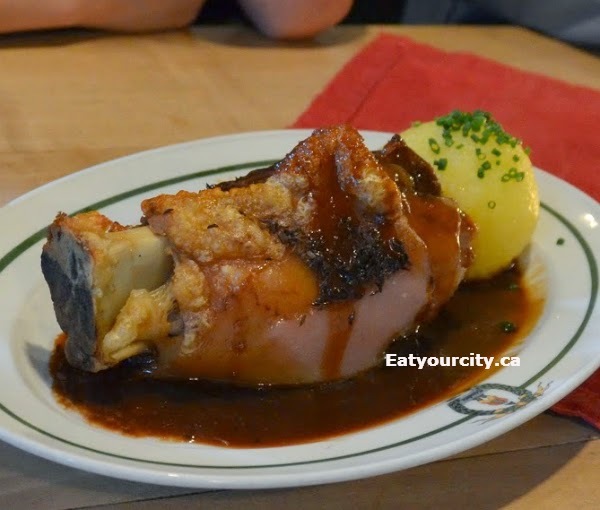 While the meat was super tender and just fell off the bone with a poke of a fork. 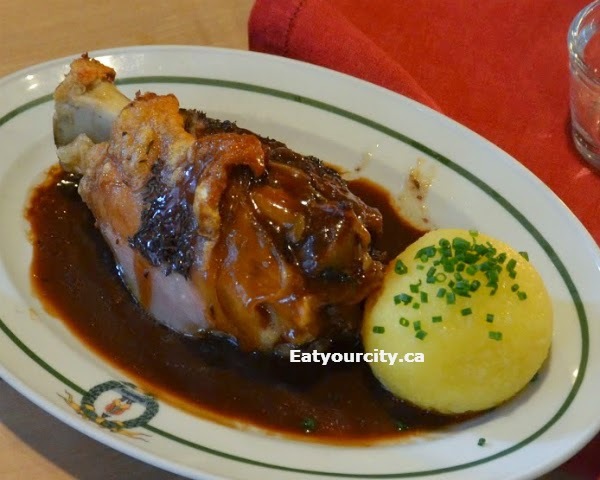 Paired with the delish savory salty pork gravy and a potato dumpling.. it was an epic entree! 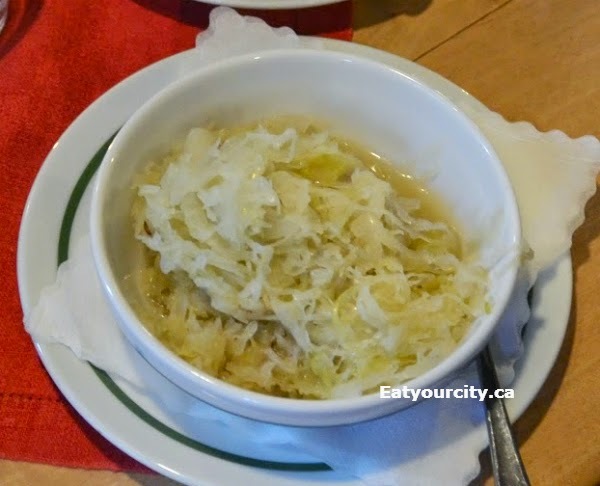 Veges came out next in the form of a big bowl of Sauerkraut - tangy, salty, savory and heated to a good texture (not crunchy crisp, not a soggy mess, but just right! ), we polished it off pretty quick! 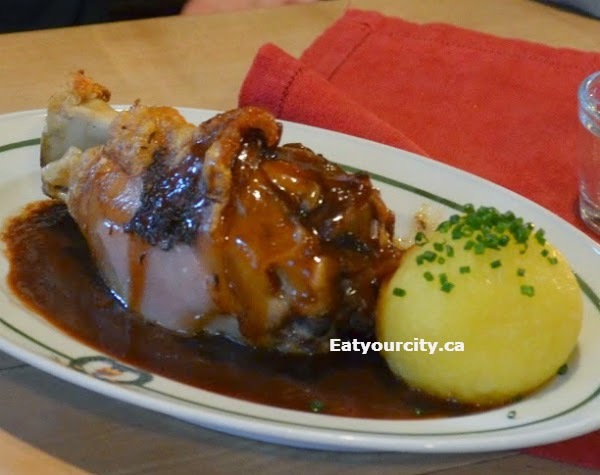 We finished off our meal with an order of Bamberger Bratwürste mit Kraut und Brot or Bamberg-style sausages with Sauerkraut and bread. The sausages have a wonderful snap to them, juicy and flavorful and disappeared like magic. And we amused locals and tourists alike as we attempted to set up our tripod and finicky remote to take this shot of the Obere Brücke bridge, completed in 1455 - which is super cool as it as the Rathaus, or City Hall built in the middle of it! 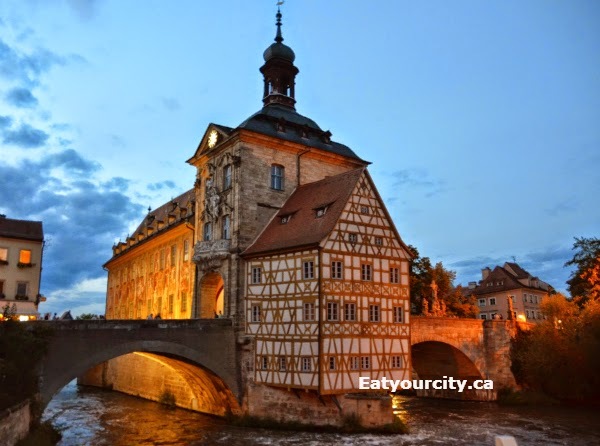 Bedtime.. and then exploring Bamberg in a day tomorrow!